THERE is no sector in society that needs leadership in greater measure than the public sector. In business, when a president is not effective, the business will soon fold up. In public organizations, when the head of the agency fails to deliver services to the public, he suffers the ire of the citizens but the agency remains. In business, an ineffective manager bodes ill for the organization; in the public sector, a corrupt public official adversely affects the whole of society. Business executives are accountable to their stockholders, employees and customers. Public sector officials are accountable to the nation and the laws of the land. From this perspective, leadership in the public sector has a greater impact than in business. This concept of leadership is very relevant to the public sector. Given the magnitude of problems that the country faces, what is needed are leaders in government and non-governmental organizations who are able to help the country move from a developing nation to a developed one and more importantly, raise the quality of life of impoverished Filipinos to one that supports their human dignity. Those who do not do so and instead raid the coffers of taxpayers’ money to enrich themselves are not leaders but (if I may coin the term with due apologies to Heifetz) “mis-leaders.” While they possess the charisma or social skills that attract people to support them, they are in fact misleading the public and bringing the country to ruin rather than a brighter future. The leadership intent or objective is thus crucial to its effectiveness. Leadership is not merely being successful in influencing people to follow the leader or in the achievement of goals. Otherwise, we will call Marcos, Hitler or Bin Laden leaders instead of dictator, mass murderer or terrorist respectively. The leader’s goals must be based on moral values and end values that support liberty, equality and justice. This should be the intent of public leaders in the country. According to Bernard Bass, who wrote “The Bass Handbook of Leadership,” research has shown that the values that leaders hold influence their behavior. He cites two types of values: terminal values such as freedom and equality which are basic to systems of political philosophy and instrumental values or values that are the means towards a desired end such as courage, imagination and obedience. A good example of how values influenced leadership behavior is reflected in the life of Department of Interior and Local Government secretary and former Naga Mayor Jesse Robredo who died in a plane crash last in 2012. He was well-loved by his constituents, particularly the poor, and held the respect and admiration of many, even those who did not know him personally. In an article in Inquirer, his style of leadership was termed “tsinelas” (slippers) leadership. “Tsinelas” symbolized his affinity with the ordinary Filipino, addressing their concerns, empowering them and literally walking in their “tsinelas.” He lived his values of love of God, country and family, service to others, integrity, courage and humility. 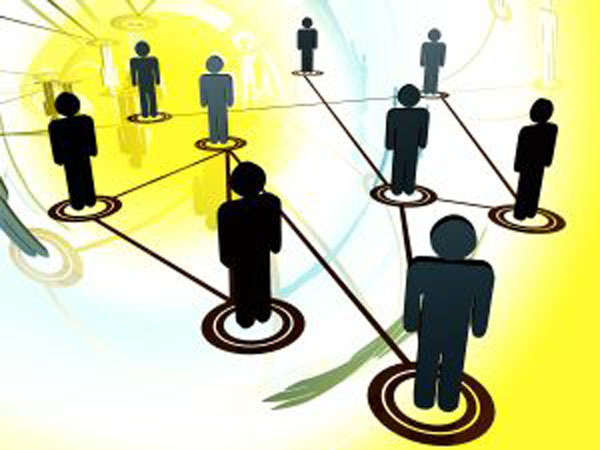 According to Bass, “successful leadership influence their followers and bring about changes in their followers’ attitudes and behaviors. In the same way, by accepting, modifying, or rejecting the influence, followers influence the leader’s subsequent behavior and attitudes.” In the Philippines where a third of the population is below the poverty line, the demands of followers on public leaders place a heavy burden on the leaders’ shoulders. When I used to host a radio program that provides job opportunities over dzRH, people would visit me at the station. A mother would bring in her handicapped daughter. A worker who barely finished elementary would ask me for a job. Others would ask for letters of recommendation for employers. Not being a rich politician, I only had information and advice to give. Frustrated, I gave up my hosting stint after a couple of years. A former municipal mayor experienced the same frustration. No one can live the high life on a municipal mayor’s salary, much less dispense money and favors with it. This mayor, who was a God-fearing person, did not use the usual channels of corruption to enrich himself in office. He said no to “jueteng,” bribes and the like. Every day, people would go to him asking for help and money for emergencies. Not having much wherewithal, he opted not to run for a second term. So few good men or women want to assume government positions. Some accept the mantle of authority in government for their own personal interest and aggrandizement. They do not balk at seeing the people’s miseries everyday but instead use them to further their political ends. Having access to dirty money, they are able to give some of their constituents their needs. Thus, it takes courage to be a leader in the public sector in the Philippines. So few can cope with the people’s expectations, escape the clutches of criminal syndicates and avoid the pitfalls of flattery and pampering. While the idea of one strong leader leading the nation out of poverty may be a tantalizing dream of many Filipinos, one person cannot institute change alone. The leadership challenges in the public sector are complex and deeply rooted. Corruption and criminality have been institutionalized over generations. This is why participation of the followers in the solution of their problems and empowerment should be part of the process of leadership in the public sector. Non-governmental organizations or NGOs have led the way in this respect. The United Nations Development Programme, based on experiences of various NGOs, recommends a framework for change management in public sector organizations. The framework cites as essential to the change process the building of change coalitions and champions, process consultations and consensus building, all of which are tools for public participation and empowerment. 1. Leader – the candidates who is rated 5 or higher on both Leadership Intention/ Will and Leadership Process will fall in this quadrant. He/she is close to the ideal public sector leader. You should definitely vote for him/her. 2. Potential Leader – the candidate who is rated 5 or higher on Leadership Intention/ Will but lower than 5 on Leadership Process will fall in this quadrant. He/ she has good intentions but does not use participative leadership. You can vote for him/her if there is no other candidate who fits the first profile. 3. 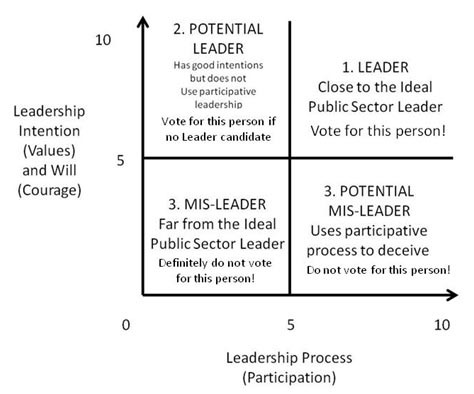 Potential Mis-leader – the candidate who is rated lower than 5 on Leadership Intention/ Will but higher than 5 on Leadership Process will fall in this quadrant. He/she may appear to be using participative processes in order to gain supporters but he/ she may not have a public-service orientation or courage to institute the necessary changes in office. You should not vote for him/her. 4. Mis-leader – the candidate who is rated lower than 5 on both Leadership Intention/ Will and Leadership Process will fall in this quadrant. He/she is the opposite of a Leader. You should not vote for this person. Knowing and supporting the candidate who hews closely to the ideal public sector leader is a first step in initiating a positive change in governance. By doing so, we ensure that we have leaders in government rather than politicians or bureaucrats.